The Beechcraft 65 / 70 / 80 / 88 Queen Air is a twin-engined eight-to-thirteen-seat corporate travel and utility aircraft with retractable landing gear produced by the US-American manufacturer Beech Aircraft Corporation. The Beech Queen Air was used as a commuter aircraft also. 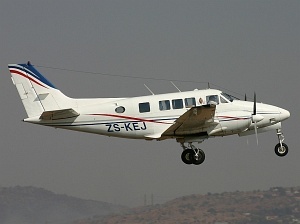 In executive configuration the Beech Queen Air is normally equipped with six passenger seats. In commuter configuration it can carry up to eleven passengers. A pressurized version is the Beech 88 Queen Air, looking very similar to the later Beech 90 King Air.